Venezuelan refugees and migrants at a shelter on the outskirts of Cúcuta, Colombia. Currently there is an influx of Venezuelans entering Ecuador, through the Colombian border. 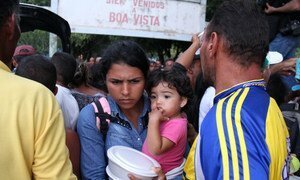 One of the largest population movements in Latin American history is under way from Venezuela, according to the UN Refugee Agency, UNHCR, which on Friday confirmed that it is increasing assistance to neighbouring Ecuador, where more and more Venezuelans are arriving each week. Amid ongoing social and political upheaval in the South American country, more than half a million people have arrived in Ecuador since the beginning of the year, UNHCR’s William Spindler said. In response to the situation, Ecuador has declared a state of emergency in the northern provinces of Carchi, Pichincha and el Oro. The development means that Ecuador can assign additional resources to Venezuelans, many of whom have endured weeks of hardship on their journey to the border, UNHCR spokesperson William Spindler said. The UNHCR spokesperson noted that Ecuador also had a “long tradition of welcoming refugees” in a region where the movement of people across borders was commonplace. Nonetheless, the rising number of arrivals have led to “pressure” on asylum registrations. According to UN Migration Agency, IOM, there has been a 900 per cent increase in Venezuelan nationals living abroad on the subcontinent from 2015 to 2017 – up from 89,000 to 900,000. A lack of visa requirements and other bilateral agreements make it relatively straightforward for Venezuelans to move through Latin America. Speaking to journalists in Geneva, IOM spokesperson Joel Millman said that Latin American press reports refer to people’s pursuit of a “Chilean dream”, a reference to the American dream that many migrants are said to pursue when migrating north. In Venezuela, “credible, shocking accounts of extrajudicial killings” and impunity for perpetrators, indicate that the rule of law “is virtually absent”, the UN High Commissioner for Human Rights (OHCHR) said on Friday, in a call for an international inquiry into the alleged violations.